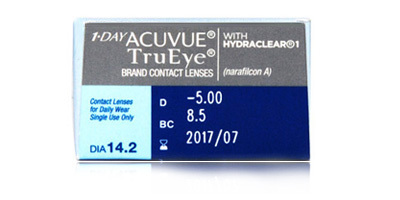 1 day Acuvue Trueye 30 pack manufactured by Johnson & Johnson offers you the unique experience of enjoying the Silicon Hydrogel (narafilcon A) comfort. 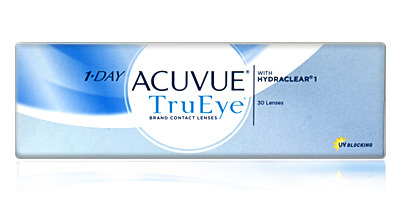 This is a high quality lens that provided superior vision acuity and exceptional and lasting moisture. 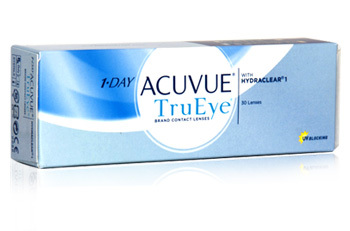 The manufacturers (Johnson & Johnson) have taken into account the modern lifestyle with its busy schedules in designing 1 day Acuvue Trueye 30 pack contact lenses. They are a great fusion of superior UV protection (> 99% of UV-B and >96% of UV-A), smooth HYDRACLEAR 1 technology and exceptional oxygen delivery. Silicon hydrogel ensures supreme oxygen permeability, allowing nearly 100% of the oxygen to pass through to the eye. This keeps your eyes white and clear. The HYDRACLEAR 1 technology ensures a smooth and moisture rich feeling. 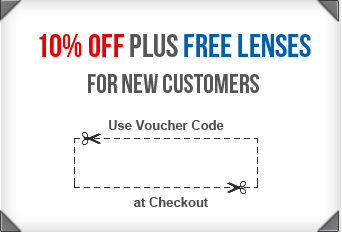 UV protection are also an important feature of this lens.